This is a follow-up to our post ["31-May-15: Lights, camera, action, terror"] of a few hours ago. Stuart Winer, writing on the Times of Israel site, says that the government approved a legislative bill today defining the steps that the Israel Prison Service can take to prevent prisoners - and in particular prisoners like Barghouti about whom we wrote today - from using cell phones. There's unfortunately no mention of the propaganda value that brand-name terrorists like Barghouti can tap into once they are able to speak to the outside world or send out photos of themselves, as happened last week (and as we discussed here). We hope the government committee understands the importance of that aspect. 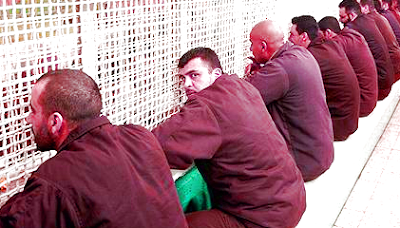 The report adds that Barghouti is now in solitary confinement. What's more, Issa Karake, a PA figure, is quoted saying the convicted killer has "begun a hunger strike in protest". Karake's change of job title is a necessary part of the transparent ruse by which the PA pretends not to be paying its terrorists from foreign aid. And the providers of that foreign pretend to believe that their money goes nowhere near those Barghoutis and Tamimis and other such loathsome sociopaths.